Music for The Secular Buddhist is provided with permission by John Kaizan Neptune, Monty Levenson of Tai Hei Shakuhachi, and Rodrigo Rodriguez. It was my great honor to meet John Kaizan Neptune at the International Shakuhachi Festival of 1998 at Boulder, Colorado, though only one of us is likely to remember the introduction. He is one of the world’s most skilled players of the Japanese bamboo flute, and has combined that passion with a natural talent for jazz composition. The introduction piece for The Secular Buddhist is the title track from his CD “Steps In Time”, available on his website, The Shakuhachi World of John Kaizan Neptune. None of us would be enjoying the other music in this podcast, the traditional Honkyoku Shakuhachi pieces, if not for Monty Levenson of Tai Hei Shakuhachi. Monty’s efforts in creating Japanese bamboo flutes for students and professional concert musicians alike, has resulted in a wonderful growing of the interest in this unique instrument. Tai Hei Shakuhachi is the premier online resource for bamboo flutes, recordings, sheet music, and more. If you have an interest in finding out more about the shakuhachi, or would just like to get some hard-to-find CD’s of traditional Japanese flute music, that’s the place to go. 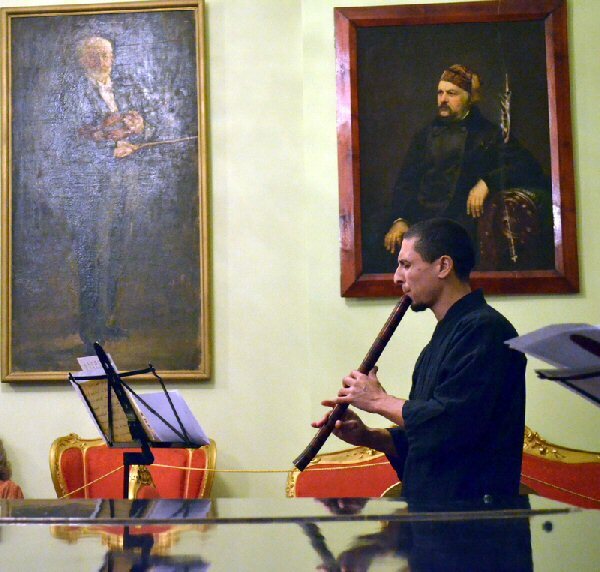 In 2011, Rodrigo received an invitation from the Russian Foreign Ministry of Culture and the prominent Moscow Conservatory (Moscow State PI Tchaikovsky Conservatory) to perform at the XIV International Music Festival “The Heart of Japan” (“Nihon-no kokoro”). Rodrigo gave the recital on December 8th 2011, promoting the school and Mu-Ryû, a style founded by his teacher Miyata Kohachiro, and has kindly provided a couple of photos from the event, shown below.